Tavish Hamilton Scott MSP (born 6 May 1966) is a Scottish politician and MSP for Shetland. He was Leader of the Scottish Liberal Democrats from 2008 to 2011. He stepped down after the 2011 Scottish Parliamentary election, in which the Liberal Democrats were reduced to five seats, down from 16 in the previous parliament. Scott was born on 6 May 1966 in Inverness, Scotland, he attended Anderson High School, Lerwick, Shetland and holds a BA (Hons) Business Studies from Napier College in Edinburgh. After graduating, he worked as a parliamentary assistant to Jim Wallace, then Lib Dem MP for Orkney and Shetland, and later as a Press Officer for the Scottish Liberal Democrats. He then returned to Shetland and became a farmer and also a councillor on Shetland Islands Council and Chairman of the Lerwick Harbour Trust. He is married with three children. Scott was elected the first Member of the Scottish Parliament for Shetland in May 1999. He was also the first parliamentarian for the Shetland Islands as a distinct entity; up to that point there had only been a single UK parliamentary constituency for both Orkney and Shetland. He served as a Deputy Minister for Parliament in the Scottish Executive from 2000 to 2001 in succession to his colleague Iain Smith, but resigned after refusing to support the Executive in a vote in the Parliament on a tie-up scheme for fishing. In 2003, he returned to the Scottish Executive as Deputy Minister for Finance and Public Services. During his time there his department piloted the Local Governance (Scotland) Act, which changed the elections for local authorities in Scotland to a proportional representation system. 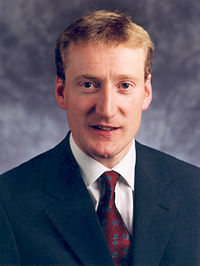 Following Nicol Stephen's election as party leader and succession as Deputy First Minister of Scotland in 2005, Scott was appointed to the Cabinet as Minister for Transport. He was re-elected with an increased majority in May 2007, and held the largest margin by percentage, 50.1%, of any MSP over their closest challenger. After the resignation of his friend and former ministerial colleague Nicol Stephen, Scott declared his candidacy for the leadership of the Scottish Liberal Democrats on 7 July 2008 at Lerwick harbour, surrounded by a group of men dressed as Vikings which is a tradition in Shetland called Up Helly Aa where Shetlanders celebrate their Viking heritage. On 26 August 2008, he was announced the winner of the leadership contest with 59% (1,450) of the votes. Following what he described as a "disastrous" set of results for the Scottish Liberal Democrats in the Scottish elections in May 2011, Scott offered his resignation as leader (remaining a Member of the Scottish Parliament). He claimed the poor showings were in part due to the coalition deal which saw the Liberal Democrats form a government with the Conservatives after the United Kingdom general election, 2010. In the run-up to the 2014 Scottish Independence referendum, Scott was a keen advocate of a "No" vote as well as recognition that whatever the outcome of the referendum there ought to be a recognition of "Northern Isles’ right to determine their own future." At the Liberal Democrat party conference in 2013 put forward a motion with fellow MSP Liam McArthur to recognise the Islands had a "separate right to self-determination" Scott said that his preferred outcome was for Shetland to become a crown dependency of the UK with its own parliament, and was backed by the cross-party Wir Shetland movement that campaigns for crown dependency status. ^ Black, Andrew (7 May 2011). "BBC News – Scots Lib Dem leader Tavish Scott quits post". Bbc.co.uk. Retrieved 2011-05-07. ^ "Bio". Tavish Scott MSP. Archived from the original on 9 August 2014. Retrieved 9 August 2014. ^ "Previous MSPs: Session 1 (1999–2003): Tavish Scott MSP". Scottish Parliament. Retrieved 9 August 2014. ^ "Election 2007 | Scottish Parliament | Election Result: Shetland". BBC News. 2007-05-04. Retrieved 2011-05-07. ^ "Tavish Scott wins Liberal Democrat leadership race". Edinburgh Evening News. 26 August 2008. Retrieved 9 August 2014. ^ "Disastrous election performance provokes Scott to stand down as party leader". Shetland Times. 7 May 2011. Retrieved 9 August 2014. ^ "SNP admits Shetland and Orkney could opt out of independent Scotland". Telegraph.co.uk. Retrieved 2016-01-30. ^ a b "Scottish independence: Northern Isles devolution bid". www.scotsman.com. Retrieved 2016-01-30. ^ "Councillor quits Wir Shetland in wake of Tavish endorsement". 6 April 2016.